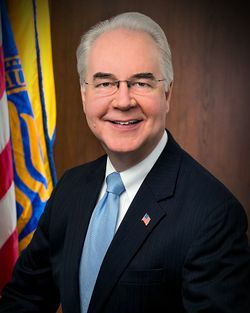 Tom Price (born October 8, 1954) is an orthopedic surgeon from Georgia who served as the 23rd United States Secretary of Health and Human Services under Republican President Donald Trump. Prior to this, he served in the Georgia State Senate from January 3, 1997 to January 3, 2005, in the U.S. House of Representatives from January 3, 2005 to February 10, 2017, and as the Chair of the House Budget Committee from January 3, 2015 to January 3, 2017. He is a conservative Republican. Price resigned on September 29, 2017, after received harsh criticism from liberal organizations for his use of taxpayer money for private and charter flights (although those same organizations had no problem when Obama Administration officials did the same thing). Despite his early resignation, Price used his tenure as HHS Secretary to advance numerous conservative policies. ↑ Baker, Sam (September 29, 2017). Tom Price resigns. Axios. Retrieved September 29, 2017. ↑ Spiering, Charlie (September 29, 2017). HHS Secretary Tom Price Resigns After Private Flights Scandal. Breitbart News. Retrieved September 29, 2017. ↑ Demko, Paul; Pittman, David; Ehley, Brianna (October 3, 2017). Why Price’s conservative imprint on HHS is likely to endure. Politico. Retrieved October 3, 2017.